As one of Chalmers Community Services Centre (CCSC) Food Pantry Volunteers, Jean readies the pantry by portioning rice, cereal and tea. In addition, Jean puts out fresh produce, eggs and cheese, weighs food donations and puts items on the shelves. “Jean helps distribute that food, treating every guest with respect, dignity and her own unique blend of kindness and humour” says Sarah Dermer, Program and Volunteer Co-ordinator. 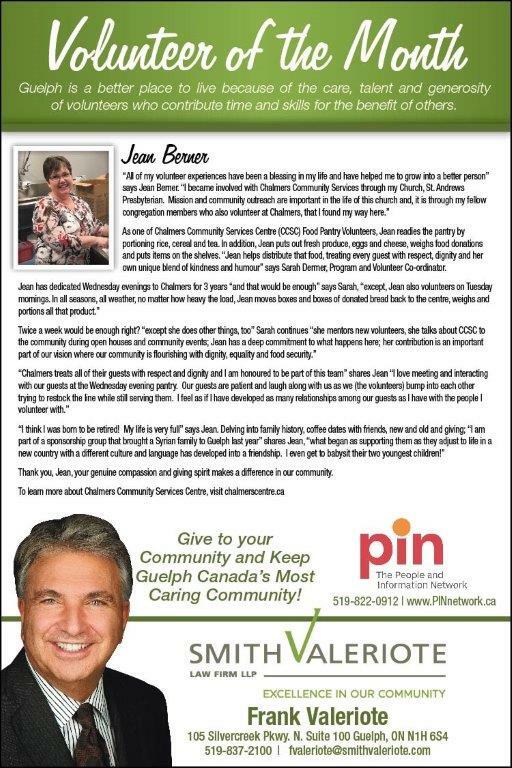 Thank you, Jean, your genuine compassion and giving spirit makes a difference in our community.